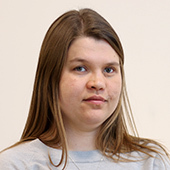 Kia Nöhr Iversen is a PhD student at the unit of Food and Nutrition Sciences. Her research is focused on the influence of cereals on bodyweight, appetite regulation and metabolic profile. Overweight and obesity are a major risk factor for development of a wide range of metabolic diseases, such as cardiovascular disease and type-2 diabetes, and it is crucial to increase our knowledge on how different foods affect bodyweight and metabolic risk markers, in order to aid the development of healthier food products and reduce the prevalence of such diseases. During her PhD studies Kia has been involved in several human intervention trials and is the primary manager of a randomized controlled weight loss trial including more than 200 subjects. There might be more projects where Kia Noehr Iversen participates, but you have to be logged in as a Chalmers employee to see them.